Fluoxetine hydrochloride (Prozac) is an antidepressant of the selective serotonin reuptake inhibitor (SSRI) class. Fluoxetine is approved for the treatment of clinical depression (including pediatric depression), obsessive-compulsive disorder (in both adult and pediatric populations), bulimia nervosa, panic disorder and premenstrual dysphoric disorder. Other indications include hypochondriasis and body dysmorphic disorder. Despite the availability of newer agents, it remains extremely popular. Over 23.1 million prescriptions for generic formulations of fluoxetine were filled in the United States in 2006, making it the third most prescribed antidepressant. According to David Wong, the work which eventually led to the discovery of fluoxetine began at Eli Lilly in 1970 as a collaboration between Bryan Molloy and Robert Rathburn. It was known at that time that antihistamine diphenhydramine shows some antidepressant-like properties. 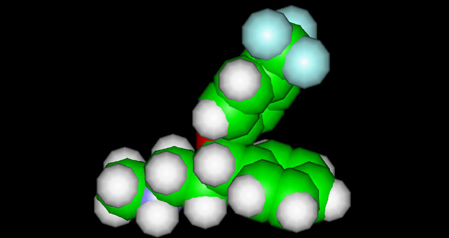 3-Phenoxy-3-phenylpropylamine, a compound structurally similar to diphenhydramine, was taken as a starting point, and Molloy synthesized dozens of its derivatives. Testing the physiological effects of these compounds in mice resulted in nisoxetine, a selective norepinephrine reuptake inhibitor currently widely used in biochemical experiments. Later, hoping to find a derivative inhibiting only serotonin reuptake, Wong proposed to re-test the series for the in-vitro reuptake of serotonin, norepinephrine and dopamine. This test, carried out by Jong-Sir Horng in May 1972, showed the compound later named fluoxetine to be the most potent and selective inhibitor of serotonin reuptake of the series. A controversy ensued after Lilly researchers published a paper entitled "Prozac (fluoxetine, Lilly 110140), the first selective serotonin uptake inhibitor and an antidepressant drug" implicitly claiming fluoxetine to be the first selective serotonin reuptake inhibitor (SSRI). Two years later they had to issue a correction, admitting that the first SSRI was zimelidine developed by Arvid Carlsson and colleagues. Fluoxetine made its appearance on the Belgian market in 1986 and was approved for use by the FDA in the United States in December 1987. Fluoxetine was the fourth SSRI to make it to market, after indalpine, zimelidine and fluvoxamine. However, the first two were withdrawn due to the side effects, and a vigorous marketing campaign by Eli Lilly made sure that in the popular culture fluoxetine has been perceived as a scientific breakthrough and associated with the title of the first SSRI. Eli Lilly's patent on Prozac (fluoxetine) expired in August, 2001, prompting an influx of generic drugs onto the market. Fluoxetine has been approved by the FDA for the treatment of clinical depression, obsessive compulsive disorder, bulimia nervosa and panic disorder. Fluoxetine was shown to be effective for depression in 6-week long double-blind controlled trials where it also alleviated anxiety and improved sleep. Fluoxetine was better than placebo for the prevention of depression recurrence when the patients, who originally responded to fluoxetine, were treated for a further 38 weeks. Efficacy of fluoxetine for geriatric as well as pediatric depression was also demonstrated placebo-controlled trials. OCD was successfully treated by fluoxetine in two adult and one pediatric placebo-controlled 13-week trials. The higher doses of fluoxetine appeared to result in better response, while the reverse relationship was observed in the treatment of depression. Fluoxetine dramatically, by 40-50%, decreased the frequency of panic attacks in two controlled trials of panic disorder patients. In three double-blind trials fluoxetine significantly decreased the number of binge-eating and purging episodes of bulimia nervosa. Continued year-long treatment of the patients, who originally responded to fluoxetine, was more effective than placebo for the prevention of bulimia nervosa episodes. In addition, rash or urticaria, sometimes serious, was observed in 7% patients in clinical trials; one-third of these cases resulted in discontinuation of the treatment. Postmarketing reports note several cases of complications developed in patients with rash. The symptoms included vasculitis and lupus-like syndrome. Death has been reported to occur in association with these systemic events. Akathisia, that is inner tension, restlessness, and the inability to stay still, often accompanied by "constant pacing, purposeless movements of the feet and legs, and marked anxiety," is a common side effect of fluoxetine. Akathisia usually begins after the initiation of the treatment or increase of the dose and disappears after fluoxetine is stopped or its dose is decreased, or after treatment with propranolol. There are case reports directly linking akathisia with suicidal attempts, with patients feeling better after the withdrawal of fluoxetine, and again developing severe akathisia on repeated exposure to fluoxetine. These patients described "that the development of the akathisia made them feel suicidal and that it had precipitated their prior suicide attempts." The experts note that because of the link of akathisia with suicide and the distress it causes to the patient, "it is of vital importance to increase awareness amongst staff and patients of the symptoms this relatively common condition". More rarely, fluoxetine has been associated with related movement disorders acute dystonia and tardive dyskinesia. Other side effects may occur, including sexual dysfunction. Possible sexual side effects can include anorgasmia, reduced libido and impotence. The FDA requires all antidepressants, including fluoxetine, to carry a black box warning stating that antidepressants may increase the risk of suicide in persons younger than 25. This warning is based on statistical analyses conducted by two independent groups of the FDA experts that found a 2-fold increase of the suicidal ideation and behavior in children and adolescents, and 1.5-fold increase of suicidality in the 18–24 age group. The suicidality was slightly decreased for those older than 24, and statistically significantly lower in the 65 and older group. This analysis was critiqued by Donald Klein who noted that suicidality, that is suicidal ideation and behavior, is not necessarily a good surrogate marker for completed suicide, and it is still possible that antidepressants may prevent actual suicide while increasing suicidality. Nevertheless, the general consensus is that "suicidal ideation has been associated with suicide attempt in retrospective studies and with suicide in prospective studies." The bioavailability of fluoxetine is relatively high (72%), and peak plasma concentrations are reached in 6 to 8 hours. It is highly bound to plasma proteins, mostly albumin. Fluoxetine is metabolized in the liver by isoenzymes of the cytochrome P450 system, including CYP2D6. The role of CYP2D6 in the metabolism of fluoxetine may be clinically important, as there is great genetic variability in the function of this enzyme among people. Only one metabolite of fluoxetine, norfluoxetine (demethylated fluoxetine), is biologically active. The extremely slow elimination of fluoxetine and its active metabolite norfluoxetine from the body distinguishes it from from other antidepressants. With time, fluoxetine and norfluoxetine inhibit their own metabolism, so fluoxetine elimination half-life changes from 1 to 3 days, after a single dose—to 4 to 6 days, after long-term use. Similarly, the half-life of norfluoxetine is longer (16 days after long-term use). For that reason, the concentration of the drug and its active metabolite in the blood continues to grow through the first three weeks of treatment, and their steady concentration is achieved only after 3-4 weeks. Moreover, the brain concentration of fluoxetine and its metabolites keeps increasing through at least the first five weeks of treatment. That means that the full benefits of the current dose a patient receives are not realized for more than a month since its initiation. For example, in a 6-week study, the median time to achieving consistent response was 29 days. Likewise, complete excretion of the drug may take several weeks. During the first week after the treatment discontinuation, the brain concentration of fluoxetine decreases only by 50%. A PET study compared the action of a single dose of fluoxetine on exclusively heterosexual and exclusively homosexual men who attested that their past and present sexual behavior, desires, and fantasies were directed entirely toward men or women, respectively. The study found that in some areas of the brain the metabolic response in these two groups was different. "Both groups, however, did exhibit similar widespread lateralized metabolic responses to fluoxetine (relative to placebo), with most areas of the brain responding in the same direction." They "did not differ on behavioral measures or blood levels of fluoxetine". The simultaneous use of fluoxetine with triptans, tramadol or other serotonergic agents can result in a rare, but potentially life-threatening adverse drug reaction called serotonin syndrome. Prozac Pharmacology, Pharmacokinetics, Studies, Metabolism. RxList.com (2007). Retrieved on 2007-04-14. Wong, DT, Bymaster FP, Engleman EA (1995). "Prozac (fluoxetine, Lilly 110140), the first selective serotonin uptake inhibitor and an antidepressant drug: twenty years since its first publication". Life Sci 57 (5): 411-41. doi:10.1016/0024-3205(95)00209-O. PMID 7623609. Wong D, Horng J, Bymaster F, Hauser K, Molloy B (1974). "A selective inhibitor of serotonin uptake: Lilly 110140, 3-(p-trifluoromethylphenoxy)-N-methyl-3-phenylpropylamine". Life Sci 15 (3): 471â€“9. PMID 4549929. Carlsson A, Wong DT (1997). "A note on the discovery of selective serotonin reuptake inhibitors". Life Sci 61 (12): 1203. doi:10.1016/S0024-3205(97)00662-0. PMID 9315511. Electronic Orange Book. Food and Drug Administration (April 2007). Retrieved on May 24, 2007. Patent Expiration Dates for Common Brand-Name Drugs. Retrieved on 2007-07-20. Prozac prescribing information (PDF). Eli Lilly (2007-06-21). Retrieved on 2008-01-09. Lipinski JF, Mallya G, Zimmerman P, Pope HG (1989). "Fluoxetine-induced akathisia: clinical and theoretical implications". J Clin Psychiatry 50 (9): 339â€“42. PMID 2549018.
Review: Leo RJ (1996). "Movement disorders associated with the serotonin selective reuptake inhibitors". The Journal of clinical psychiatry 57 (10): 449â€“54. PMID 8909330. Hansen L (2003). "Fluoxetine dose-increment related akathisia in depression: implications for clinical care, recognition and management of selective serotonin reuptake inhibitor-induced akathisia". J. Psychopharmacol. (Oxford) 17 (4): 451â€“2. PMID 14870959. Rothschild AJ, Locke CA (1991). "Reexposure to fluoxetine after serious suicide attempts by three patients: the role of akathisia". J Clin Psychiatry 52 (12): 491â€“3. PMID 1752848. Hansen L (2001). "A critical review of akathisia, and its possible association with suicidal behaviour" 16 (7): 495â€“505. doi:10.1002/hup.325. PMID 12404546. Hansen L, Kingdom D (2006). "Akathisia as a risk factor for suicide". The British journal of psychiatry : the journal of mental science 188: 192. doi:10.1192/bjp.188.2.192. PMID 16449715. Gerber PE, Lynd LD (1998). "Selective serotonin-reuptake inhibitor-induced movement disorders". Ann Pharmacother 32 (6): 692â€“8. PMID 9640489. Caley CF (1997). "Extrapyramidal reactions and the selective serotonin-reuptake inhibitors". Ann Pharmacother 31 (12): 1481â€“9. PMID 9416386. The most recent case report, see Blum D, Maldonado J, Meyer E, Lansberg M (2008). "Delirium following abrupt discontinuation of fluoxetine". Clin Neurol Neurosurg 110 (1): 69â€“70. doi:10.1016/j.clineuro.2007.08.016. PMID 17913343. For the earlier case reports see the references cited therein. Rosenbaum JF, Zajecka J (1997). "Clinical management of antidepressant discontinuation". J Clin Psychiatry 58 Suppl 7: 37â€“40. PMID 9219493. Schatzberg AF, Blier P, Delgado PL, Fava M, Haddad PM, Shelton RC (2006). "Antidepressant discontinuation syndrome: consensus panel recommendations for clinical management and additional research". J Clin Psychiatry 67 Suppl 4: 27â€“30. PMID 16683860. Fava M (2006). "Prospective studies of adverse events related to antidepressant discontinuation". J Clin Psychiatry 67 Suppl 4: 14â€“21. PMID 16683858. Zajecka J, Fawcett J, Amsterdam J, Quitkin F, Reimherr F, Rosenbaum J, Michelson D, Beasley C (1998). "Safety of abrupt discontinuation of fluoxetine: a randomized, placebo-controlled study". J Clin Psychopharmacol 18 (3): 193â€“7. PMID 9617977. Levenson M, Holland C. Antidepressants and Suicidality in Adults: Statistical Evaluation. (Presentation at Psychopharmacologic Drugs Advisory Committee; December 13, 2006). Retrieved on 2007-05-13. Stone MB, Jones ML (November 17, 2006). Clinical Review: Relationship Between Antidepressant Drugs and Suicidality in Adults (PDF). Overview for December 13 Meeting of Psychopharmacologic Drugs Advisory Committee (PDAC) 11-74. FDA. Retrieved on 2007-09-22. Levenson M, Holland C (November 17, 2006). Statistical Evaluation of Suicidality in Adults Treated with Antidepressants (PDF). Overview for December 13 Meeting of Psychopharmacologic Drugs Advisory Committee (PDAC) 75-140. FDA. Retrieved on 2007-09-22. Klein DF (2006). "The flawed basis for FDA post-marketing safety decisions: the example of anti-depressants and children". Neuropsychopharmacology 31 (4): 689â€“99. doi:10.1038/sj.npp.1300996. PMID 16395296. Mann JJ, Ellis SP, Waternaux CM, Liu X, Oquendo MA, Malone KM, Brodsky BS, Haas GL, Currier D (2008). "Classification Trees Distinguish Suicide Attempters in Major Psychiatric Disorders: A Model of Clinical Decision Making". J Clin Psychiatry: e1â€“e9. PMID 18190232. Tarek A. Hammad (September 13, 2004). Results of the Analysis of Suicidality in Pediatric Trials of Newer Antidepressants (PDF). Presentation at the Meeting of Psychopharmacologic Drugs Advisory Committee and the Pediatric Advisory Committee on September 13, 2004 25, 28. FDA. Retrieved on 2008-01-06. Committee on Safety of Medicines Expert Working Group (December 2004). Report on The Safety of Selective Serotonin Reuptake Inhibitor Antidepressants (PDF). MHRA. Retrieved on 2007-09-25. Gunnell D, Saperia J, Ashby D (2005). "Selective serotonin reuptake inhibitors (SSRIs) and suicide in adults: meta-analysis of drug company data from placebo controlled, randomised controlled trials submitted to the MHRA's safety review". BMJ 330 (7488): 385. doi:10.1136/bmj.330.7488.385. PMID 15718537. Retrieved on 2007-09-25. Drug Treatments in Psychiatry: Antidepressants. Newcastle University School of Neurology, Neurobiology and Psychiatry (2005). Retrieved on 2007-04-14. Kinnunen LH, Moltz H, Metz J, Cooper M (2004). "Differential brain activation in exclusively homosexual and heterosexual men produced by the selective serotonin reuptake inhibitor, fluoxetine". Brain Res. 1024 (1-2): 251â€“4. doi:10.1016/j.brainres.2004.07.070. PMID 15451388. Healy D (2004) Let them eat Prozac. New York: New York University Press. pp 124â€“148.